This is the third in a 24-part series look at every episode of “The Jetsons” TV show from the original 1962-63 season. Each and every year at least one company goes knocking on the doors of the major news outlets and announces to the world that the futuristic vision of a flying car will be a practical reality within a few short years. Some of these companies appear to be making these promises in earnest, fully recognizing that their flying cars — should they ever hit the market — will be wildly expensive and essentially just road-legal airplanes. Other flying car companies are far more sketchy and have gotten into hot water with the SEC over their questionable fundraising practices. But any way you look at it, a flying car in every garage is still a long way from becoming a part of the average American’s reality. The Jetsons didn’t invent the flying car, but it sure did a lot to cement the idea of the airborne automobile into the American imagination. The third episode of “The Jetsons” is the show’s first in-depth look at the cars of the future. Titled “The Space Car,” the episode originally aired on Sunday October 7, 1962. The episode opens with a seemingly sentient computer doing its best to wake George from his slumber. The family all meets for breakfast in the dining room and George does his best to cook a meal by push-button. In true early-TV sitcom fashion George fails miserably at this task. Jane talks to her friend by videophone and then we’re introduced to two shady-looking characters who will serve to create confusion with their cops and robbers hijinks. George and Jane set out to buy a new car and arrive at Molecular Motors where they and the viewers at home are treated to a car salesman’s pitch from the year 2062. Longtime readers of Paleofuture will, of course, be familiar with dozens of flying cars that predate the 1962 arrival of The Jetsons on the small screen. From the fully functional (if impractical) Aerocar of the early 1950s to Hugo Gernsback’s 1923 vision of a two-wheeled flying car, we’ve seen hundreds of predictions for the flying car of the future throughout the 20th century. Plenty of flying cars would follow the Jetsons as well, like when two men in California died in 1973 after they tried strapping airplane wings on a Pinto. The car shopping montage in this episode appears to have been inspired by the tone and style of Tex Avery’s late-1940 and early-’50s “Of Tomorrow” cartoons. Avery’s cartoons looked at the TV, house, farm and car of tomorrow with an irreverent flare. Many of the sight gags from “The Space Car” pay homage to this style of dissecting the various goofy caricatures of futuristic thinking, adhering to the comedic (and often sexist) stylings of the time. 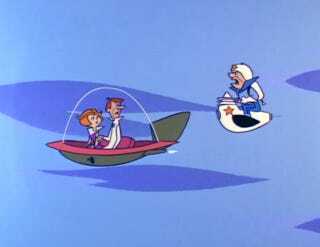 In fact, the “mother-in-law” joke we see in The Jetsons is identical to that of Tex Avery’s “Car of Tomorrow” cartoon short, right down to the color of the car. Can you imagine an autoist driving up to a “gas” station 50 years from now and receiving replacement energy capsules for his car instead of getting a tank full of liquid fuel? Also, can you imagine flying automobiles directed by automatic guidance systems? These were possibilities discussed last week by Dr. Andrew A. Kucher, Ford Motor company vice president in charge of engineering and research, in an address at Northwestern University. Arthur Radebaugh’s syndicated Sunday comic “Closer Than We Think” was also a likely inspiration for The Jetsons’ vision of flying cars. The April 6, 1958 edition of the strip imagined cars that would ride on a cushion of air, according to Kucher, who was eager to tout this idea in the press during that time.